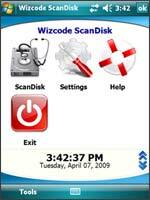 Wizcode ScanDisk Mobile -Storage cards are susceptible to errors. Over time, clusters can become corrupted, part of files can become lost, and a range of other errors can occur. You should take the time to run ScanDisk to monitor the health of your storage cards and repair any issues found, especially if the number of files and applications are growing and your system is getting old - it may save you from a whole lot of lost data in the long run. FAT mismatches - this is the most dangerous of file system logic problems with potential for massive data loss. The File Allocation Table tracks which data cluster follows the previous cluster within files and directories, and this information is near-impossible to deduce if it is lost. For this reason, there are two copies of the FAT, and ScanDisk detects the "mismatched FAT" problem when these differ. ScanDisk "fixes" this problem by asking the user which FAT copy is the correct one, and by overwritting the contents of the other one with it. Always backup all data on the card before attempting recovery of a mismatched FAT.